The biggest winner at tonight's Golden Globe Awards wasn't Birdman or Boyhood -- as many pundits were predicting. 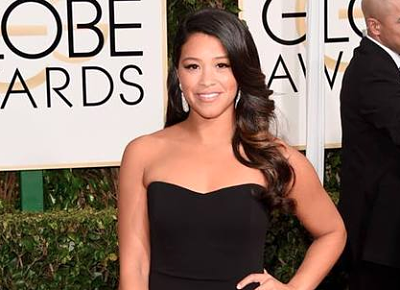 But Gina Rodriguez -- a first-time nominee for her lead role on the CW's hit show Jane the Virgin, who walked away with the award for Best Actress in a Television Series Musical or Comedy. Rodriguez, 30 -- an actress of Puerto Rican descent from Chicago -- was the only Latina nominated at the Golden Globes this year, which isn't at all unusual -- it's still extremely rare for Latina actresses to be nominated at the Globes. How rare? The last time a Latina was nominated for a Lead Actress Golden Globe award was when America Ferrera scored a nomination for Ugly Betty back in 2009 (yes, SIX years ago). And the last time a Latina won the award -- which was also the only time a Latina has ever won! -- was also America Ferrera for Ugly Betty back in 2007. Prior to that, Eva Longoria was nominated for her breakout role as Gabrielle Solis on ABC's Desperate Housewives in 2006, but lost out to Mary-Louise Parker (Weeds). And before Eva -- believe it or not -- the last time a Latina was nominated in the Best Actress category at the Globes was when Rita Moreno earned a nomination for 9 to 5 waaaaay back in 1993 (13 years prior). So when Gina Rodriguez got up on stage last night to accept her award for Best Actress and gave that beautiful teary-eyed speech -- where she eloquently said her win "represents a culture that wants to see themselves as heroes" -- those weren't just words. Good roles for Latinas in Hollywood are still in very short supply; we're seldom the leads of TV shows; noticeably absent at most awards shows and when Latinas are depicted on the small (and big) screen, it's often as the "exotic best friend" or something one-dimensional or stereotypical. Consider this: Gina's fellow nominees in the best actress category included Julia Louis-Dreyfus (as the vice president of the United States in HBO's Veep); Edie Falco (as a three-dimensional and fascinatingly complex nurse, mother and wife in Showtime's Nurse Jackie; Taylor Schilling (as an affluent upper-class woman forced to serve a prison sentence for a crime she committed years prior on Netflix's hit series Orange is the New Black) and Lena Dunham for her role as an aspiring writer coming of age with her group of friends in New York on HBO's Girls. Latinas don't often get to play roles like these on the small screen -- and that matters when it comes to awards shows, because everyone knows an actor is only as good as the roles he or she gets to play -- and awards often go to well-written, three-dimensional characters. If Latinas never get to play those characters and instead have to settle for stereotypical, one dimensional roles -- like the poorly developed Latina sidekick or best friend -- it's not likely Latinas will win major awards. A lot of young Latino actors have said to me: 'Why can't we get an Oscar? Why can't we be nominated?' And the terrible truth is that if you don't get the right parts -- you're not going to be. Are you going to get an Oscar nomination for one of those Judd Apatow movies? Not likely -- no matter what nationality you are. And I think that until we as Latino actors get to do roles that have really serious meaning, it's going to be impossible to get nominated. Gina's role on Jane the Virgin does have "serious meaning" in that it's about an American girl of Latin descent who has very relatable struggles (it's not a show about being Latina, but rather a show about an interesting girl who happens to be Latina.) She's relatable in the same way that America Ferrera was relatable on Ugly Betty -- as an ambitious young woman working in the magazine business (not surprisingly, Jane is produced by Betty producer Ben Silverman, who clearly understands that being Latino in America means being just like everyone else). As Gina told the New York Times, "The industry's had this constant notion that Latinos have a different story," when "there's nothing about me that's different." So Gina is the Golden Globes' biggest winner tonight not just because she won and not just because it's a historic win for her network (The CW), but also -- and more importantly -- because she refused to settle for less. Props to you, Gina. This story originally appeared on EXCLUSIVLee.com.